he was charged with escorting the souls of the dead to the underworld. The dog is associated with Hermes for its intelligence and devotion. According to myth, Hermes was born of Zeus and Maia, daughter of Atlas. He was a shrewd thief from his earliest hours. Before nightfall on his first day of life, he stole most of Apollo's heifers. Zeus made him return the heifers. In contrition, Hermes invented the lyre and gave it to Apollo. Hermes continued to play malicious tricks but also was generous in his protection of others: for instance, he saved Odysseus from the magical spells of Circe. Hermes appears in Greek mythology more often than any other deity. The Greeks identified him closely with the Egyptian god of wisdom and magic, Thoth. 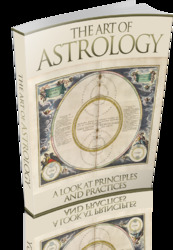 Hermes is said to have learned the mysteries of the universe, which he sought to teach others. Hermes has been equated with Odin and Wotan in Norse and Teutonic mythology, and with Buddha. Hermes, along with Thoth, is personified in Hermes Trismegistus, a mythical figure said to have written the HERMETICA texts of ancient sacred learning and lore. Hermes Trismegistus "The thrice greatest Hermes," a mythological blend of the Egyptian god Thoth, who governed mystical wisdom, MAGIC, writing and other disciplines, and was associated with HEALING; and the Greek god Hermes, the personification of universal wisdom and patron of MAGIC, the swift, wing-footed messenger god who carried a magic wand, the caduceus. The ancient Greeks associated Hermes with Thoth so closely that the two became inseparable. "Thrice greatest" refers to Hermes Trismegistus as the greatest of all philosophers; the greatest of all kings; and the greatest of all priests. Both Thoth and Hermes were associated with sacred writings. As scribe of the gods, Thoth was credited with all sacred books. In some Egyptian writings, he was described as "twice very great" and "five times very great." Hermes was credited with the authorship of 20,000 books by Iamblichus (ca. 250-300 B.C.E. ), a Neo-platonic Syrian philosopher, and more than 36,000 by Manetho (ca. 300 B.C.E. ), an Egyptian priest who wrote the history of Egypt in Greek, perhaps for Ptolemy I. According to myth, both Thoth and Hermes revealed to mankind the healing arts, magic, writing, astrology, sciences and philosophy. Thoth recorded the weighing of souls in the Judgment Hall of Osiris Hermes conducted the souls of the dead to Hades. Hermes, said Francis Barrett in Biographia Antiqua, ". . . communicated the sum of the Abyss, and the divine knowledge to all posterity . . ."
Hermes Trismegistus provided the wisdom of the light in the ancient Egyptian mysteries. He carried an emerald, upon which was recorded all of philosophy, and the caduceus, the symbol of mystical illumination. Hermes Tris-megistus vanquished Typhon, the dragon of ignorance and mental, moral and physical perversion. 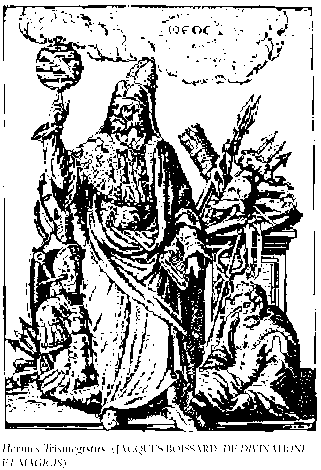 The surviving wisdom of Hermes Trismegistus is said to be the HERMETICA, 42 books that profoundly influenced the development of Western occultism and magic. These books, probably authored by a succession of anonymous persons date to between the third century B.C.E. and the first century C.E. 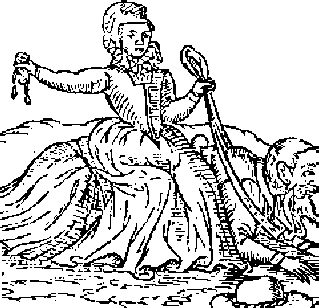 Why is hermes associated with witchcraft?